VISITORS ARE INVITED to tour the Cemetery year ’round, experiencing the rich textures and treasures of Forest Hills — one of America’s oldest and most beautiful garden cemeteries. Our beautiful landscape complements our nationally known collection of memorial sculpture by some of the country’s most renowned artists, including works by Daniel Chester French, Martin Milmore, and Thomas Ball. A full color Visitor’s Guide featuring over 60 points of interest is available at the Visitor’s Kiosk inside the Main Gate for a recommended $1 donation to the Forest Hills Educational Trust. Garden of Memories, a fascinating guidebook by Susan Wilson, contains six self-guided tours exploring different parts of the Cemetery. Forest Hills Cemetery by Anthony Mitchell Sammarco, draws on archival photographs from our own and other collections to tell the Cemetery’s history through the past 170 plus years. Both books are available for purchase at the Cemetery business office; they can also be ordered by mail. PLEASE NOTE: See our Hours & Directions page for further information. Visiting hours are also posted on the three entrance gates of the Cemetery: Our main entrance at Forest Hills Avenue, the Walk Hill Street entrance, and our pedestrian gate on Tower Street. Please plan your visits accordingly, and note that the closing hours change seasonally. Visitors who wish to leave a floral tribute at graveside, please refer to our Floral Decoration Policies. Deliveries from florists are welcomed. Please direct your florist to leave deliveries at the Cemetery Office with the name of the deceased and our staff will take the flowers to the graveside. 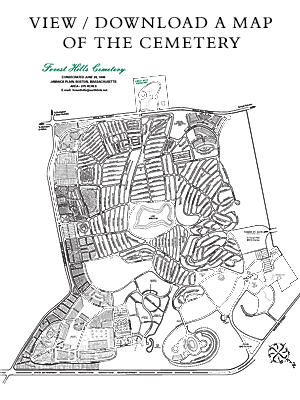 Complimentary printed copies of the Cemetery Map are available at the Cemetery Office.